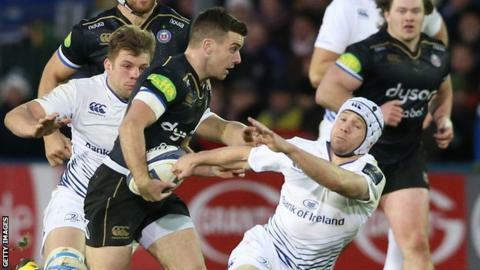 Bath opened their delayed European Champions Cup campaign with a hard-fought win against Leinster. A George Ford penalty and drop-goal gave the hosts a 6-3 lead at the break. The England fly-half added a second penalty after the break but Ireland 10 Johnny Sexton's brace, to add to his first-half kick, levelled matters. Bath scored a penalty try from a scrum, only for Leinster to level through Josh van der Flier's converted try, but a third Ford penalty saw Bath edge home. Bath, who saw last weekend's game against Toulon postponed after the terror attacks in Paris, looked to play with pace and width from the first whistle, unafraid to attack from deep and keen to get their dangerous back three involved whenever possible. But Leinster's defence was superb, with Ben Teo'o making his mark in midfield, and in the end it was the power of the Bath scrum that proved key. They won half a dozen penalties at the scrum to deny Leinster momentum and give Ford the chance to keep the scoreboard ticking over. And it was a mighty shove midway though the second half that prompted referee Jerome Gacres to award the penalty try that looked like being crucial. Three-time champions Leinster rarely looked threatening but Sexton's boot kept them in touch, and when they brought on their replacements the new faces played a major role in levelling the score. They injected pace into the visitors' game and Leinster academy product Van Der Flier ran a beautiful line to slice through the Bath defence, before showing good strength to go over in a double tackle. The visitors then had a chance to take a late lead, but Sexton's 55m penalty attempt fell short and Bath countered from underneath their posts. When they were awarded a scrum midway inside the Leinster half, their fired-up eight again took the Irish side apart. From the resulting penalty, Ford made light of the difficult angle to drill the kick between the posts to secure victory for Bath and condemn Leinster to a second straight defeat. Bath head coach Mike Ford: "We showed our inexperience at 16-9 up. We were in control of the game, but we stupidly did things that let them back in. "I am pleased we won against a Leinster side full of internationals. Our scrum was awesome - Henry Thomas and Nick Auterac were outstanding - but we can't afford to give teams easy outs and chances to score points like we did today." Bath: Watson; Rokoduguni, Devoto, K Eastmond, Banahan; Ford, Cook; Auterac, Webber, Thomas, Hooper, Attwood, Garvey, Louw, Houston. Replacements: Homer for Watson (77), Priestland for Devoto (71), Matawalu for Cook (56), Catt for Auterac (65), Batty for Webber (53), Lahiff for Thomas (64), Faosiliva for Houston (53). Leinster: Nacewa; McFadden, Te'o, Fitzgerald, D Kearney; Sexton, Boss; Healy, Cronin, Ross, Toner, Triggs, Ruddock, Murphy, Heaslip. Replacements: Kirchner for D Kearney (78), L McGrath for Boss (67), J McGrath for Healy (51), Tracy for Cronin (67), Moore for Ross (51), D Ryan for Triggs (52), Van der Flier for Murphy (64).